Mic Clayton was inducted as a Fellow of the Australian Hydrographers Association on Tuesday 26 October 2016. Mic has had a varied career as a hydrographer. Working for agencies including Sydney Water (1980-94), NSW Department of Water Resources (1994-95), Tas. Department of Primary Industries, Water and Environment (1995-2002), and as Team Leader with Snowy Hydro since 2002. Mic served as AHA Publicity Officer from 2002-2009. His achievements included producing the AHA Journal in an improved format, with a higher standard of technical articles. Mic also developed the website through several iterations, finally moving it to a modern content management system. Mic was a member of the steering committee overseeing the drafting of the National Industry Guidelines for Hydrometric Monitoring, now published by the Bureau of Meteorology. Mic has continued to be proactive in developing the hydrographic profession. 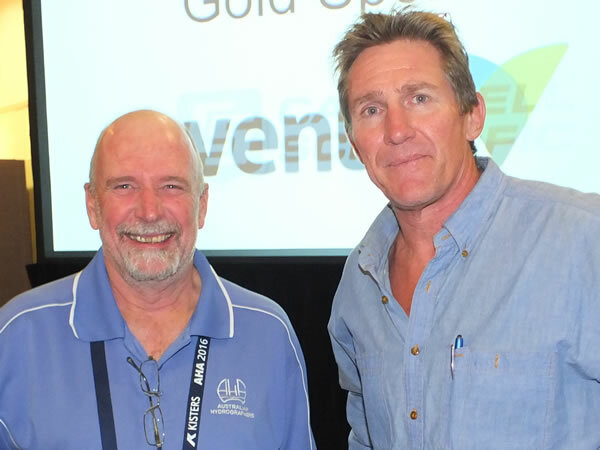 He is the most prolific author in the AHA journal and has 19 technical articles published on the AHA website, and has introduced initiatives such as the ADCP regatta held in 2015. Mic was a key player in the AHA 2008 Canberra conference, organising the field trip to the Snowy Mountains. Congratulations Mic for your significant contribution to the profession and your appointment as “Fellow of the Australian Hydrographers Association”.